As a way of honoring the 17 lives lost in the Parkland shooting, South Hills participated in National Walkout Day. Safety was a huge priority for the administration, so the walkout was held during the school’s break with 17 minutes added. Although, many students were frustrated that the walkout was added into a break, believing that it takes away from bringing awareness to the upsetting situation. The walkout consisted of speeches, a poster signing and a balloon ceremony, which were led by students. In addition, 17 desks were placed in the quad and an orange balloon was tied to each one. While the names of the students were listed as part of a speech and the song “Imagine” played in the background, each balloon was cut off and allowed to fly freely to the sky. Tables, papers, pens and bins were provided for students who wanted to write a letter to Trump, Congress, State Senators or Marjory Stoneman Douglas High School. When students were done, they inserted the letter to an envelope and put it into the bin of the place they wanted it sent to. 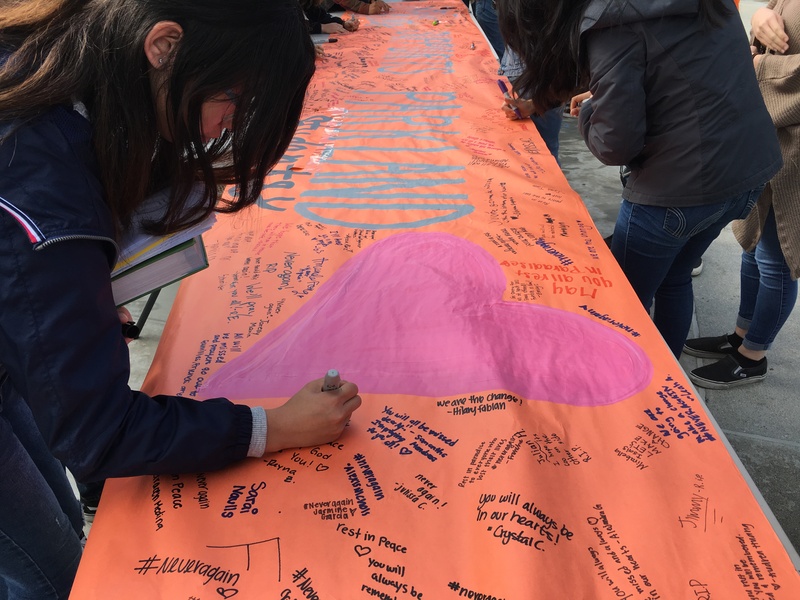 On top of that, a large, orange poster was placed opposite of the tables, which allowed students to sign their names and write a small message to those who died. All across the poster, phrases like “never again,” “rest in peace” and “we need change” were consistently signed over and over again. Despite the meaningful events and activities placed to bring awareness to what happened, others didn’t feel as strongly to these views. Other students stated that the walkout took away from learning in the classes and that politics were being heavily integrated into the event when they thought it shouldn’t be. Others were angered by the ASB for playing music in the background or the event taking place during break instead of students actually walking out. The big debate became centered around gun control. Should teachers be able to carry guns? Was mental health being dismissed? How much would gun control change? Would the subject of gun control and politics take away from the commemoration? “Why do we keep letting this happen?” is the best question to ask. On average, there has been one school shooting per week since the start of 2018. What does that mean? That means that too many lives have been lost to situations that society could’ve prevented. How and why is another argument in itself, but what’s important is that ignorance to these cases is completely diminished while attention is properly brought to call for change. May it stop there and a lesson be taught to everyone.